From 2015-2017, we’ll be monitoring the effects of ‘keyline subsoil plowing’ on seasonal soil moisture using the Yeoman 6SB subsoil plow on three unique farms in the Capital Region, BC. Hatchet & Seed is pleased to announce the project:“Keyline Water Management: Field Research & Education in the Capital Region”. From 2015-2017, we’ll be monitoring the effects of ‘keyline subsoil plowing’ using the Yeoman 6SB subsoil plow on three unique farms in the Capital Region. Agriculture and Agri-Food Canada (AAFC) and the BC Ministry of Agriculture are committed to working with industry partners. Opinions expressed in this website are those of the authors and not necessarily those of AAFC, the Ministry of Agriculture or the Investment Agriculture Foundation. Raise awareness about the potential benefits of keyline design for flood/drought proofing landscapes, increasing soil carbon, and reducing nutrient leaching and stormwater runoff overloading into local creeks and near-shore marine environments. Promote the integrated use of keyline design in a diverse number of production systems with a special focus on the adaptation potential of ‘perennial agriculture’. Adapt keyline design strategies & techniques to the regional context in an open sourced way with the input of local farmers and agricultural experts. The 'Keyline Plow' coulter and shanks, designed for minimal surface disturbance. There is a growing demand for more efficient on-farm water management and 'keyline design' has begun to garner more widespread adoption in North America, particularly among those practicing agro-forestry, silvo-pasture and ally cropping. Keyline design represents one of several land management best practices that contribute to flood and drought proofing farms. For this project, we have created a pilot study to explore how one aspect of keyline design, keyline plowing, might be used to relieve compaction and increase infiltration of rainfall on the farm landscape. 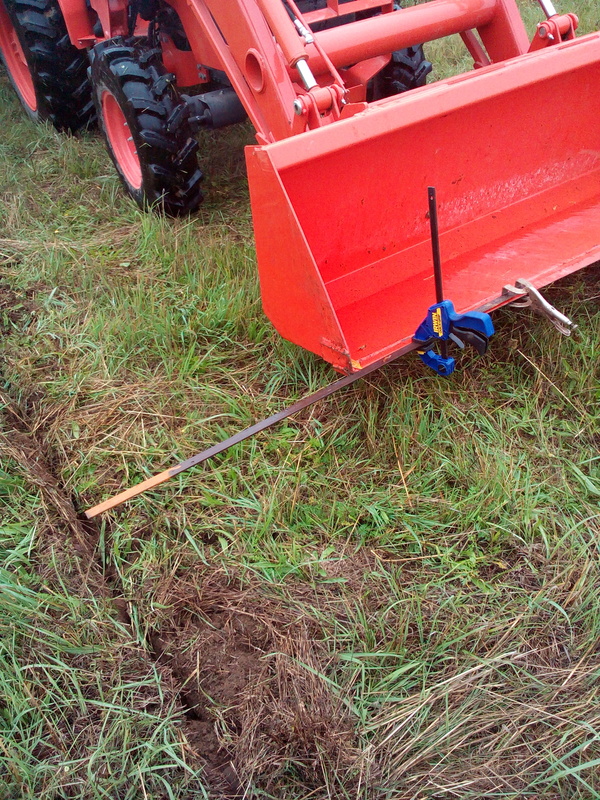 'Keyline plowing' is only one component of the keyline system developed by P.A. Yeomans and it may or may not be applicable to every individual farm context. Keyline water management also encompasses the 'patterning of the landscape' and placement of water reservoirs, irrigation lines, roads, as well as orientation of crops, orchards and grazing systems. Keyline plowing is best used in conjunction with cover cropping and management-intensive grazing; however, the purpose of our study is to see what effect keyline plowing has on its own for water infiltration/storage. We wanted to minimize variables; in addition, if this pilot study suggests keyline plowing can improve infiltration and storage of water on sloped, compacted landscapes, it is the simplest aspect of keyline design that can be implemented to improve water efficiency on existing farming operations. To test the potential benefits of 'keyline plowing’, we have set up our pilot program to compare keyline treated pasture to a control (untreated pasture) on three sites. 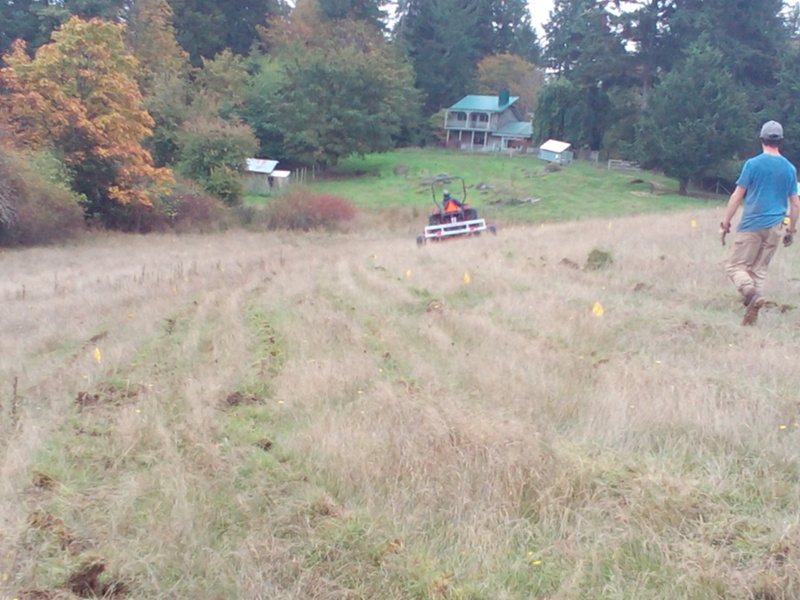 On one site, nut trees will be planted on keyline layout as well, with keyline plowing occurring in between tree rows. As this study is a pilot, it represents a relatively small sample size. Our project agrologist Sara Duncan (P.Ag.) has identified some of these constraints, which will be included in the final report in 2017. Below is a simplified summary of our program. We've chosen two farms (Central Saanich + Salt Spring Island) to install permanent soil moisture probes at different depths on both control & keyline-plow-treated plots. Another farm in Central Saanich will be monitored using subjective field and farmer observations. Both sites are sloped landscapes with compacted soils (we hit 300 psi in the first 6 cm in October) supporting mostly un-managed pasture. One site had moderate soil carbon levels, the other very poor. We've taken baseline soil samples for both treatment and control plots that include: major/minor nutrient profile, total carbon, active carbon, pH, % organic matter, C:N ratio, and bulk density. We created transects downslope on both treated and untreated plots to measure compaction using a penetrometer. We measured in October after a long period of drought when soil was at peak compaction. Immediate results were that the plowing relieved compaction down to plow depth, not just in the ripline but 10-12 cm on either side of the ripline. We will measure compaction through the study to see whether reduced compaction is sustained. We're very pleased with the initial monitoring project set-up, and are excited to share information about our project as it unfolds. A tractor guide ensures equidistance between riplines. Keyline plowing compacted, steep sheep pasture. 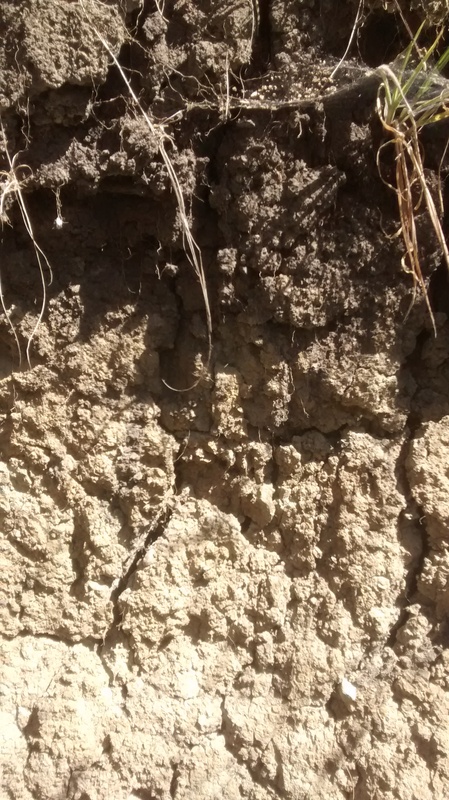 A 'duplex soil', with carbon-rich topsoil above a clay-loam. Tayler is an ecological landscape designer, permaculture practitioner and project manager. Focusing on edible landscaping and climate-smart land design, he operates Hatchet & Seed, with his partner Solara Goldwynn. Tayler will be responsible for managing project logistics, completing open-access farm plans for each participating farm and ensuring successful project delivery. Darren Doherty has extensive experience across the world in regenerative agriculture project design, development, management and training. Darren has been involved in the design & development of nearly 2000, mostly broadacre projects across 6 continents in close to 50 countries. Darren is the originator of the Regrarians Platform process which outlines a strategic & logical process to the development of regenerative agricultural systems. She will be responsible for designing and implementing the soil monitoring component of the project. Mark Benson owns and operates Downey Road Stables and will provide tractor services and other farm implements for the field research. 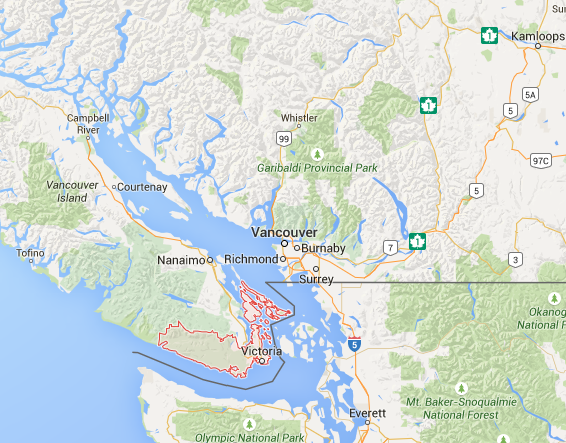 Organically grown produce, cut flowers, pork, poultry, and lamb on Salt Spring Island. On-farm accommodation, cut flowers for events, and Community Supported Agriculture. Historic 10 acre farm in Central Saanich with goats, bees, chickens, fruit trees, herbs, veggies and more. The new owners Brea and Todd are looking to turn the farm into a hub for education in ecological mixed farming. A small scale vegetable and cut-flower producer in Central Saanich, selling to various local markets and restaurants. Sign up for notifications on upcoming workshops and project updates.